Entrance to Fort Ringgold. Image available on the Internet and included in accordance with Title 17 U.S.C. Section 107. Henry Clay Davis (1814–1866). Image available on the Internet and included in accordance with Title 17 U.S.C. Section 107. FORT RINGGOLD. Fort Ringgold, the southernmost installation of the western tier of forts constructed at the end of the Mexican War, stood guard for nearly a century over the Rio Grande and Rio Grande City. On October 26, 1848, Bvt. Maj. Joseph H. LaMotte led two companies of the First United States Infantry to Davis Landing, near the newly established Rio Grande City in Starr County. The army leased thirty-three acres from Henry Clay Davis, the town founder, whose heirs sold 350 acres to the government for $20,000 in 1878. 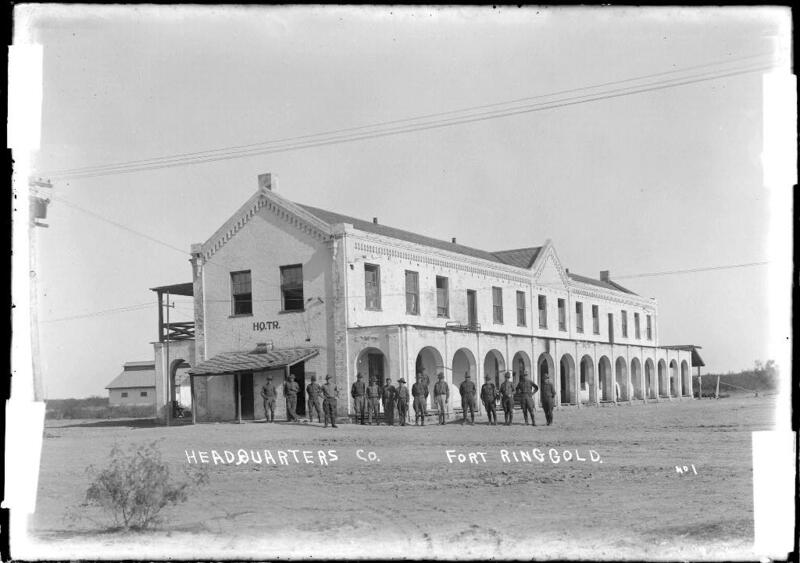 Known initially as the Post at Davis Landing, the fort bore the names Camp Ringgold and Ringgold Barracks before being named Fort Ringgold in the year of the purchase. The name was in honor of Bvt. Maj. Samuel Ringgold, the first United States Army officer to die from wounds received in the battle of Palo Alto (May 8, 1846); he died on May 11. The military chose the site to protect the area from Indian and Mexican attacks. Aerial View of Fort Ringgold. Image available on the Internet and included in accordance with Title 17 U.S.C. Section 107. The ninety-six-year occupancy of the post was marked by several interruptions, at times when the government considered it redundant, followed by regarrisoning when the region was threatened. Major periods of occupation were from 1848 until the Civil War intervened in 1861; from 1865 until military exigencies in the Philippines closed it in 1906; and from 1917 to 1944. The army declared the fort surplus and disposed of the property in 1944. The installation was of flimsy construction until after the Civil War. Construction began on a new post in 1869 at the same location, and by the mid-1870s it took on a permanent look with the erection of frame and brick structures along a palm-lined parade ground. Ringgold was one of the most attractive posts along the border. Congress appropriated additional funds for improvements in 1917. In the nineteenth century Ringgold hosted a number of prominent military figures, including Robert E. Lee, John J. Pershing, and possibly Jefferson Davis. In 1875 Capt. Leander H. McNelly and a contingent of Texas Rangers garrisoned the post. Fort Ringgold Historic Marker. Image available on the Internet and included in accordance with Title 17 U.S.C. Section 107. 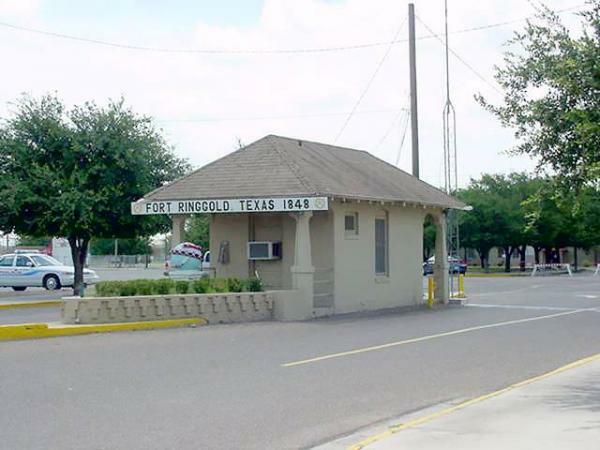 Fort Ringgold assured permanence for the isolated Rio Grande City and socially and economically affected the life of the community while it safeguarded the citizenry from border violence. The post housed the area's first telegraph office, fueled the local economy through federal appropriations, and waged protracted warfare on smugglers, rustlers, and insurrectionists who ravaged the region. The Cortina War and the unrest along the border during the Mexican Revolution particularly emphasized the importance of the garrison. Ringgold troops under the command of Maj. Samuel P. Heintzelman ended the threat of the former by joining forces with John Salmon Ford and the Texas Rangers to rid the area of Juan N. Cortina in 1860. 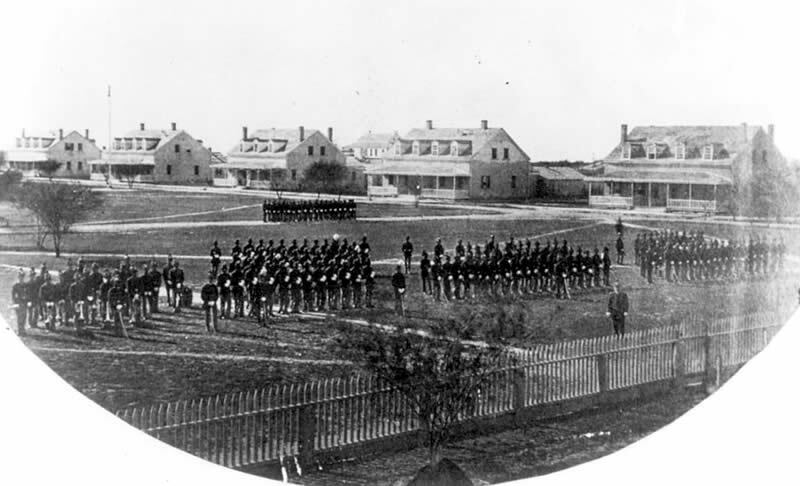 Troops at Fort Ringgold (circa 1886). Courtesy of Texas Beyond History. Image available on the Internet and included in accordance with Title 17 U.S.C. Section 107. Headquarters at Fort Ringgold (1947). Image available on the Internet and included in accordance with Title 17 U.S.C. Section 107. The most serious rift between Fort Ringgold and Rio Grande City occurred in 1899 when Troop D of the Ninth United States Cavalry briefly garrisoned the installation. The black troops, returning triumphantly from the Cuban campaign, quickly grew impatient at racial restrictions and harassment. Tensions heightened amid conflicting reports of impending attacks on the fort and town. On the night of November 20 post commander 2d Lt. E. H. Rubottom responded to a presumed assault on the garrison by ordering Gatling gunfire on the area between the post and town. Only one minor injury resulted, but Rubottom's action succeeded in quelling the disturbance. 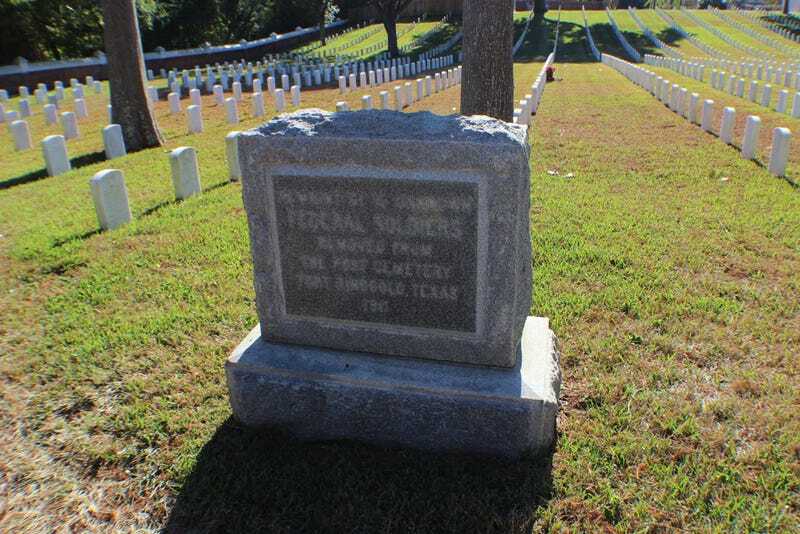 Ensuing federal, state, and grand jury investigations failed to specify culpability or motivation, although many townspeople and other Texans insisted that soldiers feigned an attack on the fort in order to wreak havoc on the community. Lt. Col. Cyrus S. Roberts of the United States Army and Thomas Scurry, adjutant general of Texas, concluded that Rubottom had acted unwisely but recommended no charges against him or others. Governor Joseph Sayers favored the locals' demand that the Ninth Cavalry be moved, and the residents requested that a white garrison be retained. Monument at Alexandria National Cemetery to Federal Soldiers from Fort Ringgold. Image available on the Internet and included in accordance with Title 17 U.S.C. Section 107. In 1909 the remains of sixteen soldiers were transferred from Fort Ringgold to Alexandria National Cemetery in Pineville, Louisiana, where a gray granite monument was erected in 1911. In 1947 remains from the abandoned Fort Ringgold post cemetery were reinterred at Fort Sam Houston National Cemetery in San Antonio. The Rio Grande Consolidated Independent School District purchased the fort property in 1949. In 1988 the district maintained the standing buildings, the most renowned of which is the Lee House, where Lee resided in 1860 while he was investigating Cortina's intrusions. Garna L. Christian, "Rio Grande City: Prelude to the Brownsville Raid," West Texas Historical Association Year Book 57 (1981). Robert W. Frazer, Forts of the West (Norman: University of Oklahoma Press, 1965). Herbert M. Hart, Old Forts of the Southwest (Seattle, Washington: Superior, 1964). Kathleen E. and Clifton R. St. Clair, eds., Little Towns of Texas (Jacksonville, Texas: Jayroe Graphic Arts, 1982). J. Lee and Lillian J. Stambaugh, The Lower Rio Grande Valley of Texas (San Antonio: Naylor, 1954). Handbook of Texas Online, Garna L. Christian, "FORT RINGGOLD," accessed April 26, 2019, http://www.tshaonline.org/handbook/online/articles/qbf42.